"I believe that a more profound mysticism can be shaped using objective depiction of nature. The mysticism of painterly means"
"The history of the theater is the history of the transfiguration of human form"
"My themes - the human figure in space, its moving and stationary functions, sitting, lying, walking, standing - are as simple as they are universally valid"
"In spite of secularization and the 'dead end of abstraction', I still think art has a job to do. 'Absolute' art, the art of 'pure' form and color, belongs to the sphere of architecture and all that it encompasses. Painting needs a medium from the visible world in order to present itself. The noblest object is the human being"
"Stage means the entire realm between religious cult and naïve public entertainment"
"The stage is after all architectonic: it is ordered and planned, and it provides a setting for form and color in their liveliest and most versatile form"
"The stage was there on the very day the Bauhaus opened, because enjoyment in designing was there on that first day. This enjoyment was first expressed in the celebrations, in the invention of masks, the making of costumes and the decoration of rooms. And it was expressed in dancing, dancing, dancing!" 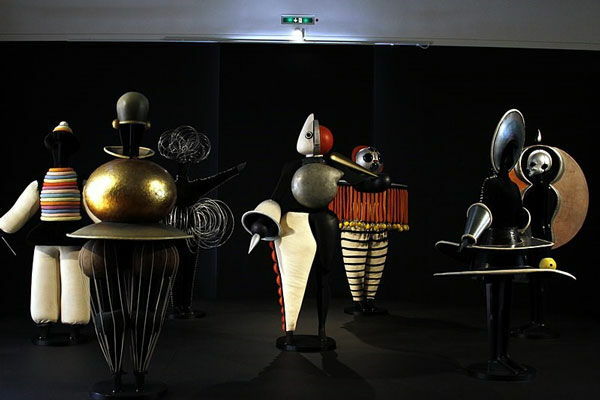 Oskar Schlemmer was born in the south-westerly region of Swabia, Germany to Carl Leonhard Schlemmer and Mina Neuhaus; he was the youngest of six children. Following the death of both of his parents around 1900, when he was 12, Oskar was raised by his sisters. Schlemmer quickly learnt to become independent and this is seen in his enrolment as an apprentice, at the age of 15, in an inlay workshop, before moving on to an apprenticeship in a marquetry workshop in 1905. During this time, Schlemmer also continued his studies, firstly as a pupil at the Kunstgewerbeschule (School of Applied Arts) in Stuttgart, before winning a scholarship to the city's Akademie der Bildenden Künste (Academy of Fine Art). Here, under the guidance of his teachers Friedrich von Keller and Christian Landenberger, Schlemmer went into the countryside and paint directly onto canvases, in the en plein air approach of earlier avant-gardes. Schlemmer's landscapes became increasingly geometric, particularly following his discovery of the work of Paul Cézanne. After a brief stint in Berlin in 1911, Schlemmer moved back to Stuttgart, where he became master student of the abstract artist, Adolf Hözel. Schlemmer continued to explore the relationship between form and color, and moved more towards Cubism. With the outbreak of the First World War, Schlemmer enlisted for military service. Following injury, he was moved to a position with the military cartography unit in Colmar, where he remained until 1918. The doll-like figures he created in this period may have been a reaction to the wounded soldiers he saw in military hospitals during the war. 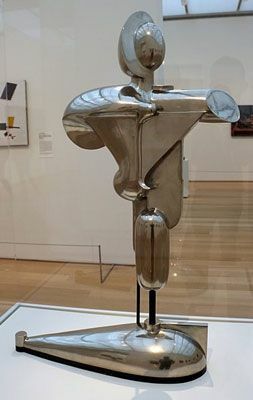 Following the war, Schlemmer began to work in sculpture, seeing it as a logical progression for his geometric art to become three-dimensional. He also recognized performing arts as an underdeveloped medium which offered new outlets for expression. Returning to the Bildenden Künste in Stuttgart, Schlemmer, alongside the artist Paul Klee, worked to bring these new ideas to the next generation of artists by updating the curriculum. These efforts to reform arts education were recognized by Walter Gropius, the director of the Bauhaus, who invited Schlemmer to run the wall painting and sculpture departments at his school. In 1920, the newly-married Schlemmer and his wife Helena Tutein (known as Tut) moved to Weimar to begin his teaching career. In the summer of 1921, shortly after Schlemmer's arrival, the Bauhaus theater workshop was founded. 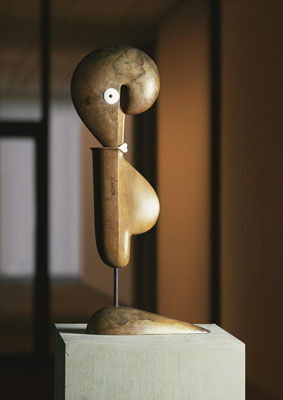 It was initially overseen by the German artist Lothar Schreyer, but two years later Schlemmer was appointed to the position, replacing Schreyer as the department's Master of Form. The Bauhaus marked the most productive period of Schlemmer's career. The school's environment of collaboration encouraged Schlemmer to think in more spatial terms and to experiment with different materials. He worked and shared ideas with Wassily Kandinsky, Paul Klee, and Johannes Itten, embracing Gropius's ethos of collective working and the idea of multiple art disciplines and life coming together as a total work of art (Gesamtkunstwerk). In 1925 the Bauhaus published some of Schlemmer's theoretical ideas in an essay entitled Mensch und Kunstfigur (Man and Art Figure). In this text, Schlemmer wrote of his experiments in painting, sculpture, and stage work, citing the human figure as linking the worlds of two-dimensional pictorial art and the three-dimensional stage. Although attracting international attention with the paintings he had produced during his time in Weimar, after the Bauhaus moved location to Dessau in 1925, he decided to focus his attentions on his stage work. During their time at the Bauhaus, Oskar and Tut also engaged fully in the life of the school, socializing with other staff members including Gunta Stolzl, Marcel Breuer, Josef Albers, and Marianne Brandt and, in 1926, Schlemmer was tasked with organizing the first Bauhaus party, The White Party. Schlemmer retained responsibility for a number of the famous parties that followed including the Beard-Nose-Heart party (1928) and The Metal Party (1929). The couple had their three children during this period, Karin (1921), Ute Jaina (1922), and Tilman (1925). Schlemmer resigned his Bauhaus position in 1929, due, in part, to the increasingly uncomfortable political atmosphere in Germany, and in part to Gropius's departure as director and the appointment of the architect Hannes Meyer as his replacement. In October 1929, the Bauhaus published a special edition of its magazine, dedicated to Schlemmer to honor his departure. 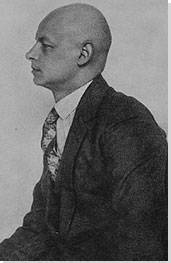 Years later, Gropius described Schlemmer as a Master who had "played a unique role in the Bauhaus community". 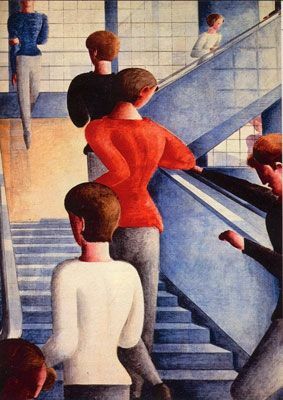 In June 1929, Schlemmer accepted a position as a teacher at the Staatliche Akademie für Kunst und Kunstgewerbe (State Academy of Fine and Decorative Arts) in Breslau. After his experimental years at the Bauhaus, he returned solely to painting, and continued to explore geometric constructions and color on canvas. Schlemmer was forced to leave Breslau in November 1932 when the Staatliche Akademie closed following the Wall Street Crash and the ensuing financial crisis. He quickly found another professorship, this time at the Vereinigte Staatsschulen für Kunst und Kunstgewerbe (United State School for Fine and Applied Art) in Berlin. His tenure, however, did not last long. With the rise of the Nazi party in the early 1930s, Schlemmer and other avant-garde artists were pushed out of their teaching roles and following Nazi election success in September 1930, it was ordered that Schlemmer's murals at the Weimar Bauhaus be painted over. Whilst many other artists left Germany, Schlemmer stayed but moved to rural south Baden. Feeling ostracized, he created no artwork from 1933-1935. His melancholy mood was only intensified by the inclusion of his work in the Nazi-organized 1937 'Degenerate Art' exhibition in Munich. Despite this, his works were exhibited in major exhibitions in London and New York in 1938. He began to paint again, but his work took on a more sombre style as he began to process his new situation through his art. Towards the end of his life, Schlemmer began to work in the Institut für Malstoffe (Institute for Painting Materials) in Wuppertal, alongside artist friends including the German painter Willi Baumeister, and Georg Muche, another Bauhaus Master. This was a lacquer factory, and the opportunity meant Schlemmer could continue to experiment with art and new materials including compositions in lacquer paint and on panels of wood, cardboard, and steel. In October 1941, he attempted to arrange a public exhibition of these works, but it proved too difficult to realize. Schlemmer died two years later from a heart attack in Baden-Baden. During his lifetime, Schlemmer's work was exhibited widely and achieved acclaim both in Germany and abroad. He was regarded as an inspiring teacher of avant-garde art and a pioneer in many fields, including painting, sculpture, and theater. He is best known for his works investigating movement, form, geometry, and rhythm, most prominently his Triadic Ballet (Triadisches Ballett) which toured extensively during the early-to-mid 1920s and is seen as a forerunner of contemporary choreography. Although the original choreography of the ballet was later lost, it was reconstructed by Ulrike Dietrich and Gerhard Bonheur in 1977 and has been performed a number of times since, most recently in Munich in 2014. Furthermore, his close professional relationships and friendships with other artists of the era have helped to shed light on the activities of the Bauhaus, for example his letters to Willi Baumeister reveal how staff and students reacted to changes at the institution. In the years after his death, there were memorial exhibitions held in Berlin, Munich, Stuttgart, and Frankfurt. This was followed by a large-scale exhibition at the Württenbergischer Kunstverein in Stuttgart to mark the ten-year anniversary of his death. 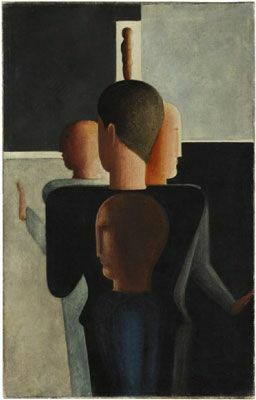 Schlemmer's wife, Tut, ensured that his literary estate went to the Staatsgalerie Stuttgart, where it joined the largest collection of his artworks to create the Archiv Oskar Schlemmer. More recently, Schlemmer's use of dance and design has influenced popular culture, including the music videos of New Order, Lady Gaga, and David Bowie and the fashion designs of Hussein Chalayan and Alexander McQueen. Schlemmer has also been a key influence on contemporary designers particularly Eric Roinestad, whose ceramic work directly references Schlemmer's costume designs. Schlemmer's reliefs mark a half-way point in his exploration of the human body from two-dimensional paintings to three-dimensional sculptures. His negotiations with Cubism are also apparent as he divides the human figure into geometric sections. The viewer sees the figure from the front and the rounded shapes denoting the head, torso, and legs are intersected with horizontal and vertical gridlines. These elements of the body are raised from the surface, but also delineated through the use of metallic paint in black, brown, silver, and bronze. Patterned sections make the figure stand out from the surface and offer more depth to the relief. Reliefs were a medium that many artists of this time experimented with including Hans Arp's, whose wooden reliefs of the 1910s and 1920s raised geometric shapes beyond the confines of the two-dimensional canvas. Schlemmer's relief works also exhibit many similarities to the Wall Pictures of his friend Willi Baumeister. 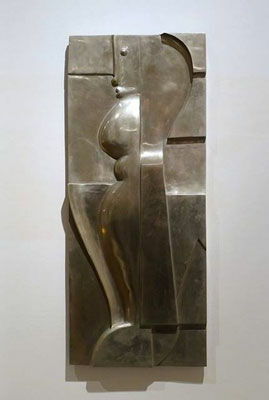 Relief H-6 PA can be seen as Schlemmer's attempt to reinterpret the European avant-garde, and particularly Cubism, along the lines of his own fixation with the human figure. In his move towards sculpture through his experimental reliefs, the artist was able to reconsider the body's relationship to space, and utilize geometry for anthropomorphic rather than abstract ends. This work foreshadows Schlemmer's use of geometry in performative art and theatre, in particular the Triadic Ballet.